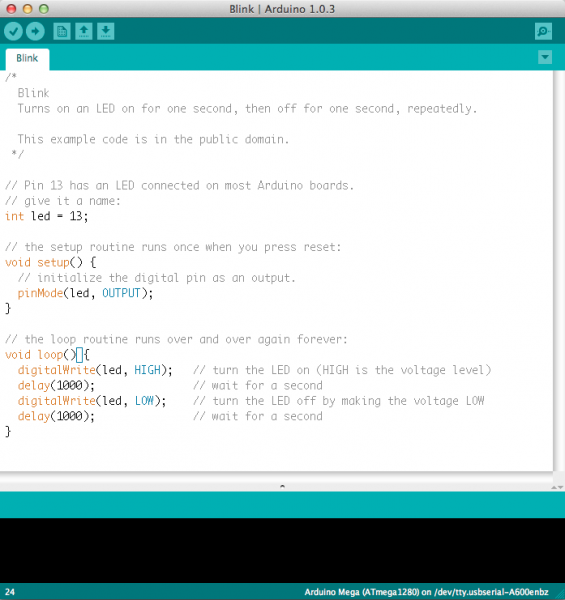 The Arduino platform has become quite popular with people just starting out with electronics, and for good reason. Unlike most previous programmable circuit boards, the Arduino does not need a separate piece of hardware (called a programmer) in order to load new code onto the board -- you can simply use a USB cable. Additionally, the Arduino IDE uses a simplified version of C++, making it easier to learn to program. Finally, Arduino provides a standard form factor that breaks out the functions of the micro-controller into a more accessible package. 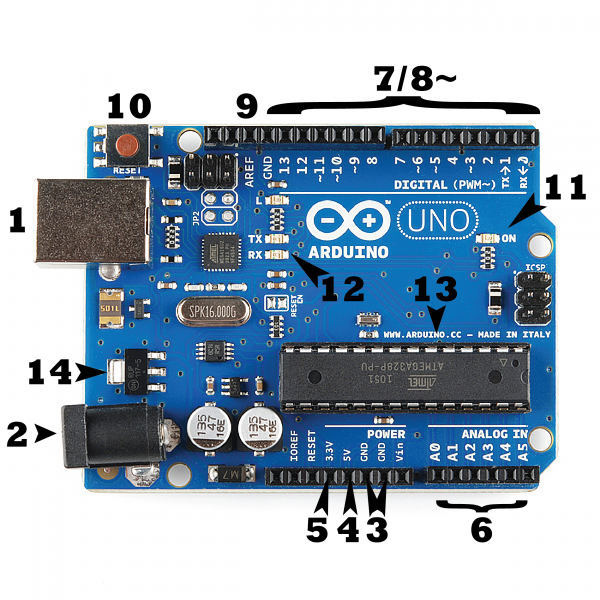 The Uno is one of the more popular boards in the Arduino family and a great choice for beginners. We'll talk about what's on it and what it can do later in the tutorial. Believe it or not, those 10 lines of code are all you need to blink the on-board LED on your Arduino. The code might not make perfect sense right now, but, after reading this tutorial and the many more Arduino tutorials waiting for you on our site, we'll get you up to speed in no time! Arduino is a great tool for people of all skill levels. However, you will have a much better time learning along side your Arduino if you understand some basic fundamental electronics beforehand. We recommend that you have at least a decent understanding of these concepts before you dive in to the wonderful world of Arduino. 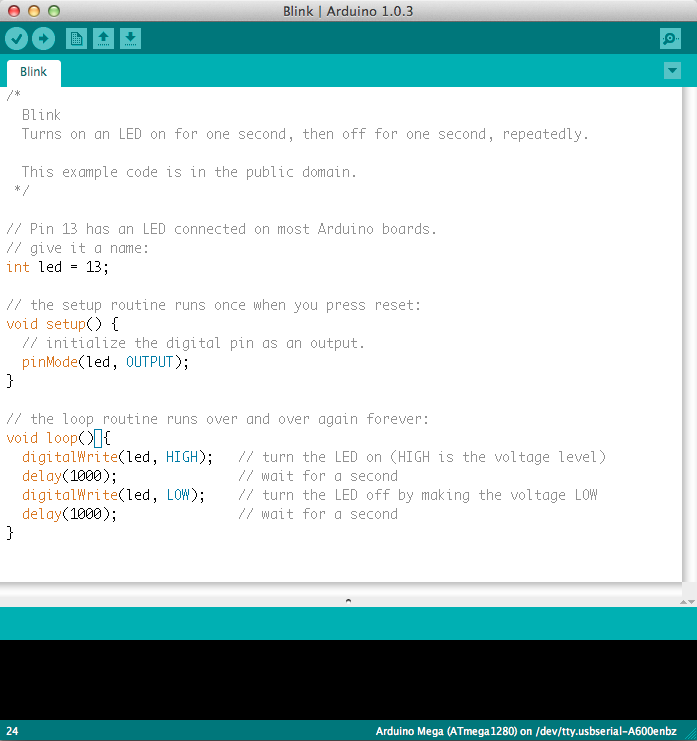 and, of course, you can find plenty more Arduino tutorials here at learn.sparkfun.com. Every Arduino board needs a way to be connected to a power source. The Arduino UNO can be powered from a USB cable coming from your computer or a wall power supply (like this) that is terminated in a barrel jack. In the picture above the USB connection is labeled (1) and the barrel jack is labeled (2). Just like the original Nintendo, the Arduino has a reset button (10). Pushing it will temporarily connect the reset pin to ground and restart any code that is loaded on the Arduino. This can be very useful if your code doesn’t repeat, but you want to test it multiple times. Unlike the original Nintendo however, blowing on the Arduino doesn't usually fix any problems. TX is short for transmit, RX is short for receive. These markings appear quite a bit in electronics to indicate the pins responsible for serial communication. In our case, there are two places on the Arduino UNO where TX and RX appear -- once by digital pins 0 and 1, and a second time next to the TX and RX indicator LEDs (12). These LEDs will give us some nice visual indications whenever our Arduino is receiving or transmitting data (like when we’re loading a new program onto the board). The black thing with all the metal legs is an IC, or Integrated Circuit (13). Think of it as the brains of our Arduino. 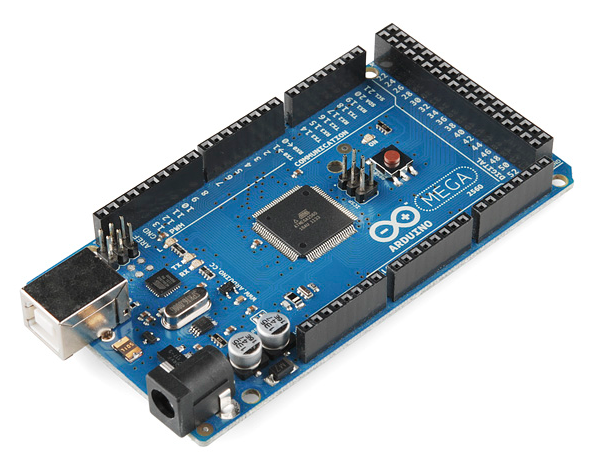 The main IC on the Arduino is slightly different from board type to board type, but is usually from the ATmega line of IC’s from the ATMEL company. This can be important, as you may need to know the IC type (along with your board type) before loading up a new program from the Arduino software. This information can usually be found in writing on the top side of the IC. If you want to know more about the difference between various IC's, reading the datasheets is often a good idea. The voltage regulator (14) is not actually something you can (or should) interact with on the Arduino. But it is potentially useful to know that it is there and what it’s for. The voltage regulator does exactly what it says -- it controls the amount of voltage that is let into the Arduino board. Think of it as a kind of gatekeeper; it will turn away an extra voltage that might harm the circuit. Of course, it has its limits, so don’t hook up your Arduino to anything greater than 20 volts. 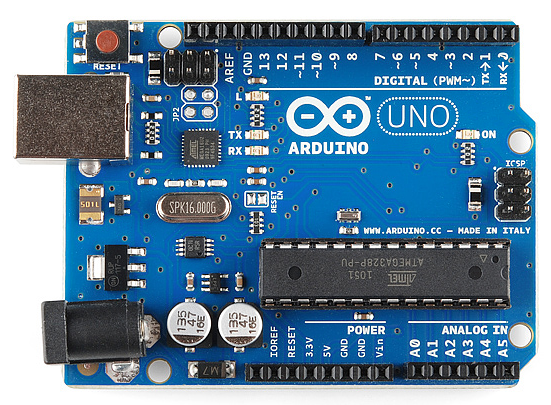 The Uno is a great choice for your first Arduino. It's got everything you need to get started, and nothing you don't. It has 14 digital input/output pins (of which 6 can be used as PWM outputs), 6 analog inputs, a USB connection, a power jack, a reset button and more. It contains everything needed to support the microcontroller; simply connect it to a computer with a USB cable or power it with a AC-to-DC adapter or battery to get started. This is LilyPad Arduino main board! LilyPad is a wearable e-textile technology developed by Leah Buechley and cooperatively designed by Leah and SparkFun. Each LilyPad was creatively designed with large connecting pads and a flat back to allow them to be sewn into clothing with conductive thread. 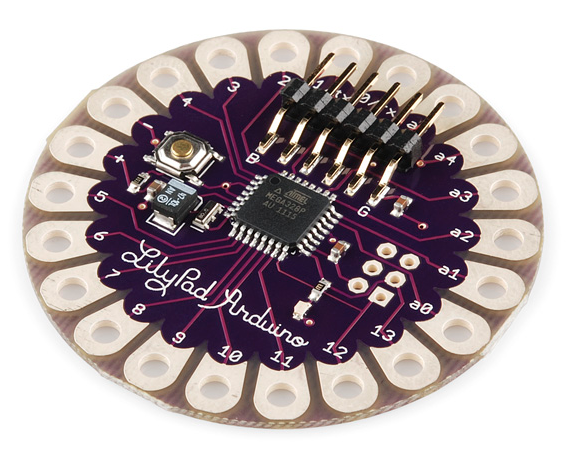 The LilyPad also has its own family of input, output, power, and sensor boards that are also built specifically for e-textiles. They're even washable! 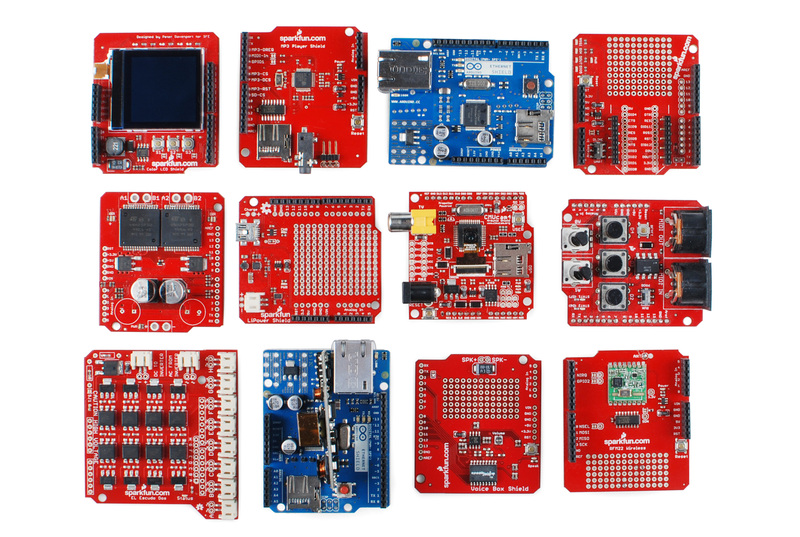 At SparkFun we use many Arduinos and we're always looking for the simplest, most stable one. Each board is a bit different and no one board has everything we want -- so we decided to make our own version that combines all our favorite features. The RedBoard can be programmed over a USB Mini-B cable using the Arduino IDE. It'll work on Windows 8 without having to change your security settings (we used signed drivers, unlike the UNO). It's more stable due to the USB/FTDI chip we used, plus it's completely flat on the back, making it easier to embed in your projects. Just plug in the board, select "Arduino UNO" from the board menu and you're ready to upload code. You can power the RedBoard over USB or through the barrel jack. The on-board power regulator can handle anything from 7 to 15VDC. The Arduino Mega is like the UNO's big brother. It has lots (54!) of digital input/output pins (14 can be used as PWM outputs), 16 analog inputs, a USB connection, a power jack, and a reset button. It contains everything needed to support the microcontroller; simply connect it to a computer with a USB cable or power it with a AC-to-DC adapter or battery to get started. The large number of pins make this board very handy for projects that require a bunch of digital inputs or outputs (like lots of LEDs or buttons). 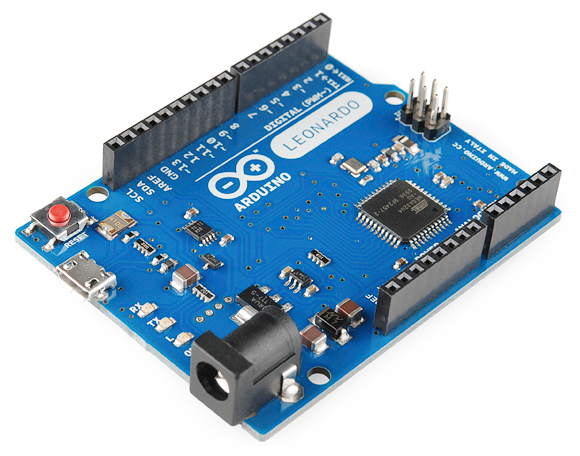 The Leonardo is Arduino's first development board to use one microcontroller with built-in USB. This means that it can be cheaper and simpler. Also, because the board is handling USB directly, code libraries are available which allow the board to emulate a computer keyboard, mouse, and more! While your Arduino board sure is pretty, it can't do a whole lot on its own -- you've got to hook it up to something. There are lots of tutorials here on learn as well as the links back in the 'What does it do' section, but rarely do we talk about the general kinds of things you can easily hook into. 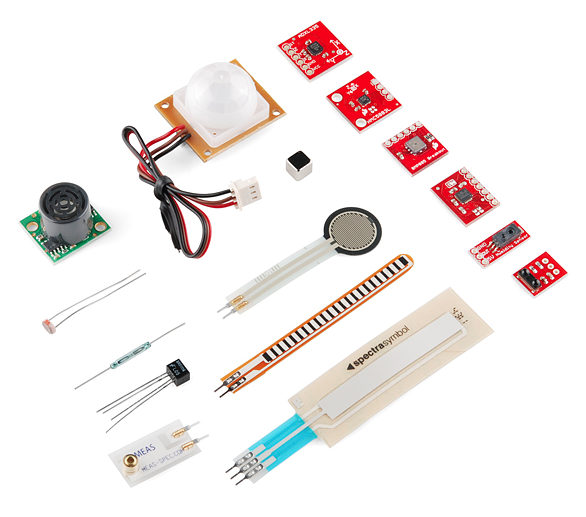 In this section we'll introduce basic sensors as well as Arduino shields, two of the most handy tools to use in bringing your projects to life. With some simple code, the Arduino can control and interact with a wide variety of sensors - things that can measure light, temperature, degree of flex, pressure, proximity, acceleration, carbon monoxide, radioactivity, humidity, barometric pressure, you name it, you can sense it! Additionally, there are these things called shields -- basically they are pre-built circuit boards that fit on top of your Arduino and provide additional capabilities -- controlling motors, connecting to the internet, providing cellular or other wireless communication, controlling an LCD screen, and much more. Now that you know all about the Arduino family, which board you might want to use for your project, and that there are tons of sensors and shields to help take your projects to the next level. Here are some further readings that may help you along in learning more about the world of electronics. Getting Started > Introduction: What is Arduino and what I can use it for? Learn how to get started making your own capes for the BeaglBone Black using the BeagleBone Proto Cape. 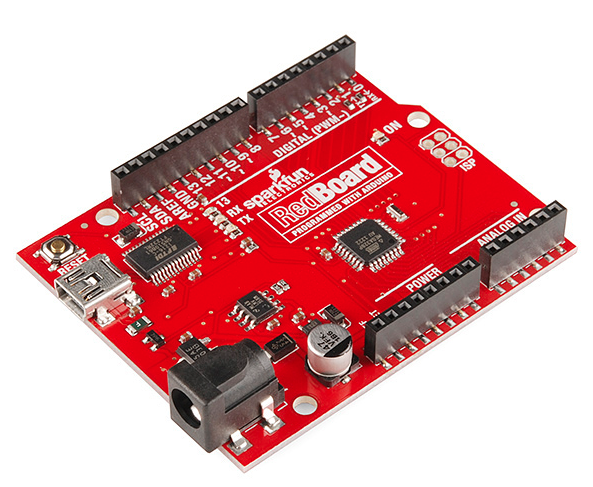 Learn how to use the SparkFun Photon IMU Shield for your Photon device which houses an on-board LSM9DS1 system-in-a-chip that houses a 3-axis accelerometer, 3-axis gyroscope, and 3-axis magnetometer. Click the buttons above for tutorials relating to the board functionality based on topic difficulty.